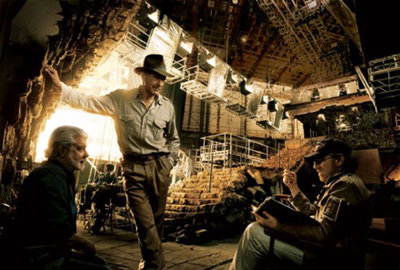 Three new behind-the-scenes photos turned up on Wednesday for “Indiana Jones and the Kingdom of the Crystal Skull” in a comprehensive Vanity Fair article. 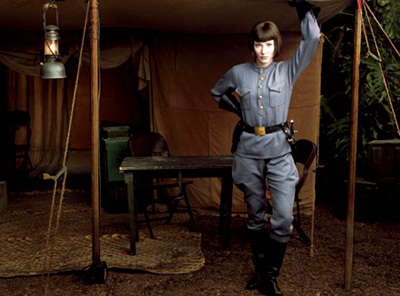 In the third photo below, we see the first photo of Cate Blanchett as a Russian agent. I’m in my second cut, which means I’ve put the movie together and I’ve seen it. I usually do about five cuts as a director. The best news is that – when I saw the movie myself the first time – there was nothing I wanted to go back and shoot, nothing I wanted to reshoot and nothing I wanted to add. I go for geography. I want the audience to know not only which side the good guy’s on and the bad guy’s on but which side of the screen they’re in. I want the audience to be able to edit as quickly as they want in a shot. [That has] been my style with all four of these “Indiana Jones” pictures. Quick-cutting is very effective in some movies – like the “Bourne” pictures – but you sacrifice geography when you go for quick-cutting. [That] is fine because audiences get a huge adrenaline rush from a cut every second and a half [in] “The Bourne Ultimatum”. There’s just enough geography for the audience never to be lost especially in the last “Bourne” film, which I thought was the best of the three. 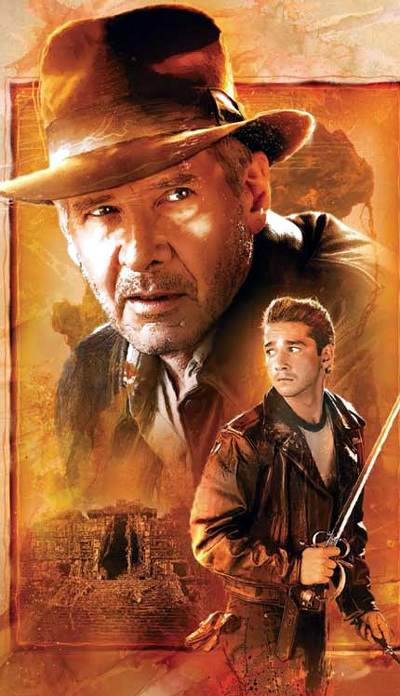 By the same token, Indy is a little more old-fashioned than the modern-day action adventure. You can read the full Vanity Fair piece here. It doesn’t stop there with “Indiana Jones and the Kingdom of the Crystal Skull” unveilings. New comic book cover art for the film (warning: minor spoilers) just surfaced as well. The most anticipated movie event of the summer comes to comics in this adaptation of the fourth “Indiana Jones” film. The intrepid doctor Henry Jones Jr. is back in his biggest adventure yet. This time, the world-renowned archaeologist finds himself caught in a series of events that all point to a discovery unlike any other. But will his rivals in pursuit of this priceless treasure seize his quarry from right under his nose? Not if he – and a few unexpected companions – have anything to say about it. The thrill and the humor, the action and the romance, the hat and the whip: everything you love about Indy is here. This is a tale sure to please longtime fans [and[ foster a whole generation of new ones. CHICAGO – John Michael epitomizes the art of the monologue. The Chicago transplant, by way of Dallas, is moving on (he says temporarily) from the city that inspired his last show, “Meatball Seance,” after notorious and successful runs of his other one-man shows, “John Michael and the Order of the Penix” and “Dementia Me.” His farewell performance is his latest, another laugh riot, “It’s NOT ALL About You John Michael,” and will take place at Mary’s Attic in Chicago’s Andersonville neighborhood on March 1st, 2019. Click here for details, including ticket information. CHICAGO – Connecting to the theater collective Nothing Without a Company means a couple of things. One, you may visit parts of Chicago you’ve never seen before – in this case a plant store in an industrial area south of Humboldt Park – and two, you will see some daring and outside-the-box stagings. “The Soccer Player in the Closet” is their latest production – a World Premiere – and it provides what the title implies and beyond. The play runs through March 17th, 2019. Click here for more details, including ticket information.